I really want my kids to grow up financially sound. I want them to understand how money works, and how it should be respected. I am terrified reading the news about credit card companies focusing in on college-aged kids. Now, while my chickens are a long way from college, I am aware that I need to start teaching them about the Benjamins now. My parents were always very hush, hush about money. I never knew how much we did, or did not have. My husband on the other hand, grew up more modestly, and always knew when there wasn’t enough. Both of us still had no clue how to deal with money when we were old enough to do it on our own. 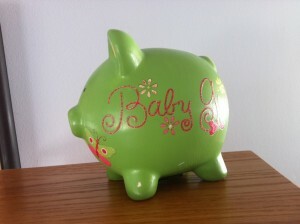 In an effort to get my kids a handle on the situation, we include them in our finances. We make sure that she is presented with plenty of opportunities to do good deeds, and can therefore raise enough money to buy what’s on her list. When Big Daddy and I sit down to write the budget, the kids help. They see how much gas, electricity, and food cost. Most of this goes over their heads for now, but maybe some of it will stick. In our house we give an allowance, but only for deeds well done. If it was a birthday present on the list, she then is given the option to make a gift, or doesn’t get to go to the party. This only happened once. When she sees birthday items on her list she works extra hard. In fact, she has a little savings built up already. Not much, I think it’s about $14, but she says she’s saving it “just in case.” I don’t know if this will all work in the long run, but here’s hoping!